At first he didn't look too happy - after all, 59 is a number, and the forever leader of the Police could easily pass for a decade younger. But he took it in stride, with guests in the jam packed audience including wife Trudie Styler, his two sisters, director Terry Gilliam, and British actor/author Stephen Fry all rocking out. Later, the consummate musician said of being enshrouded in the surprise: "I was trying to sing, after all. I had a song to do!" He protested too much, I think. He didn't know what was coming, but said his faithful road manager, Billy Francis, "had had a look on his face all day. I knew he was up to something." By the end of the song he was playing, 'She's Too Good to Me', Sting gave in to the mischief as the balloons piled up around him. I'd caught up with Sting's classically orchestrated show on Thursday in Paris, where the audience - again, sold out to the rafters in the Bercy theater - stamped their feet like thunder to show their unanimous approval of the two hour set that takes a couple dozen of Sting's well known songs and reimagines them in pop-classic settings. 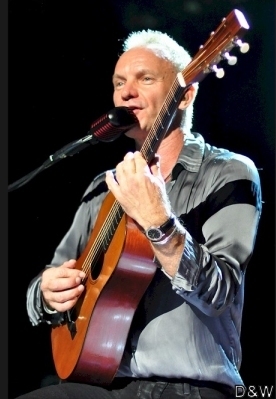 In front of a French audience, Sting - who can often seem school teacher serious on stage - connected, and the crowd loved him. He belly danced to 'Desert Rose' and two stepped with his band through the just-added 'Cowboy Song'. During emotional numbers like 'When We Dance' and 'Why Should I Cry for You' his passion resonated with the audience. In London, where performing at the Royal Albert is always a milestone, two sold out nights is quite a feat. Saturday night's show was extra special. At the start, Sting told the crowd: "It's my 59th birthday, I'm starting my 60th year." Many in the audience were young enough to be his children's ages. Sting is either at the low end age wise of the classic rock star generation, or an elder statesman to the New Wave crowd. It just depends on how you look at it. For a lot of his audience, it's seeing a rock "artist" at work for the first time after daily exposure to pre-packaged commercialism. The way Sting looks at it, he's a kid. "I love this show," he told me a couple of times over the Paris to London period. "I could do it forever." And you can see why. This huge catalog of songs is so well constructed that its transformation to the symphonic seems natural. Unlike other rockers who've tried to "mellow out" their music as they've aged, Sting's transit in this direction comes off as ebullient and cool. He not only looks good, but he sounds like a million bucks, too. At the Royal Albert, I had a seat with an unusual angle toward the stage, just above and to the side of the singer's microphone. Sting is by himself on that spot, sort of home plate, where there's no cheat sheet for lyrics, no augmentation for his vocals other than his beautiful, soulfully voiced back up singer, Jo Lawry. He's out there on his own, which is sort of quaint in the era of Auto Tune and computerized gimmicks. After Saturday's show, a few friends and family made it through a drenching rain across London to the narrow basement club Bungalow 8. Sting's two sisters, Angela and Anita, and Trudie's sister, Heather, were among the guests sprinkled through a room of well wishers. Fry - a large presence in the small room - commandeered the bar area and helped reach drinks over the heads of models and other Bungalow types. A promised "stripper" turned out to be an athletic pole dancer, which was maybe a sign of the times. Another sign: while Sting may be 59, his 20 year old daughter with Styler, Coco Sumner, has taken London by storm. Following in the footsteps of dad and older brother Joe (whose group Fiction Plane played Paris a couple of nights before Sting), Coco has her first big hit in the charts here with 'In Spirit Golden'. On the train from Paris to London, a proud papa played it for me from his IPad, and said: "That's the best thing I've heard in two years."